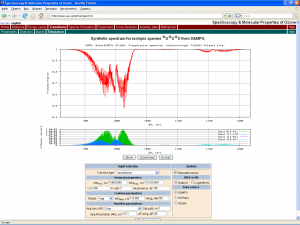 S&MPO (“Spectroscopy and Molecular Properties of Ozone”) is an Internet accessible information system devoted to high resolution spectroscopy of the ozone molecule, related properties and data sources [Y.L.Babikov, S.N. Mikhailenko, A. Barbe, Vl.G. Tyuterev, J. Quantitative Spectrosc. Radiat. Transfer, 145, p. 169-191 (2014) ]. 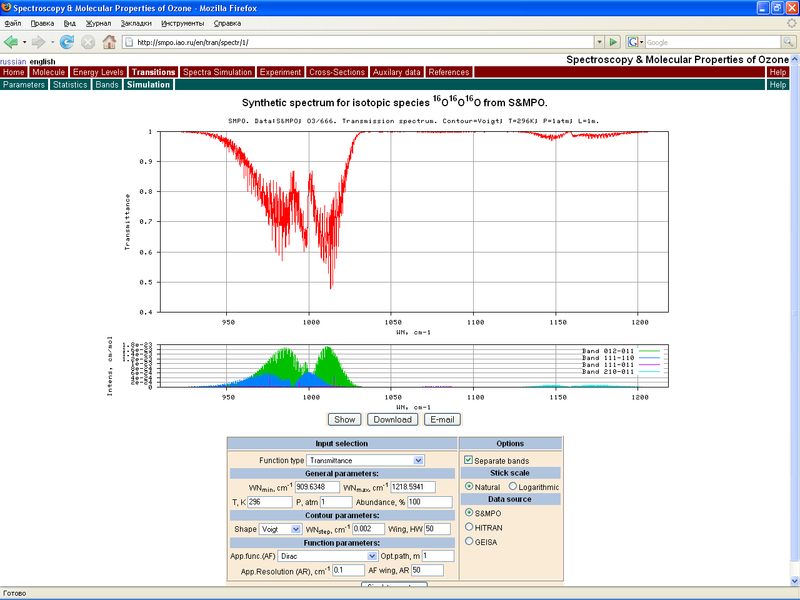 S&MPO contains information on original spectroscopic data (line positions, line intensities, energies, transition moments, spectroscopic parameters) recovered from comprehensive analyses and modeling of experimental spectra as well as associated software for data representation written in PHP Java Script, C++ and FORTRAN. The line-by-line list of vibration-rotation transitions and other information are organized as a relational database under control of MySQL database tools. The main S&MPO goal is to provide an access to all available information on vibration-rotation molecular states and transitions under extended conditions based on extrapolations of laboratory measurements using validated theoretical models. Applications for the S&MPO may include: education/training in molecular physics, radiative processes, laser physics; spectroscopic applications (analysis, Fourier transform spectroscopy, atmospheric optics, optical standards, spectroscopic atlases); applications to environment studies and atmospheric physics (remote sensing); data supply for specific databases; and to photochemistry (laser excitation, multiphoton processes). extensions of node software for data transformation.